Get Dressed For Battle Pole Axe 25 1/4" overall. High carbon steel construction. We Make A Promise That We Will Use The Best Material For The Item. (you can adjust size as per your fitting). This royal blazon of arms features a pair of lion-headed mythological beasts flanking a lion shield and the majestic crown of the royal family. 30½"Wx2½"Dx22½"H.
A very fine and unusual pair of French majolica ceremonial shields with an unusual turquoise iridescent glaze over incredibly detailed battle scenes. 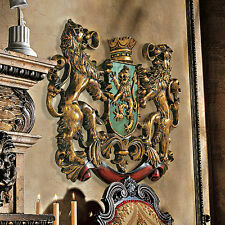 These are most likely copies of a real Renaissance period royal shield. Great price for a movie used prop. 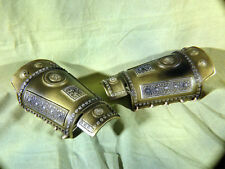 From the hit film Troy (2004) starring: Brad Pitt, this is a very detailed set of replica Gauntlets like the ones Hector used in the film. They were painstakingly made from pictures of the original prop set. Cuirass/Cuirasse : Matching front and back plates (a rarity!). The front plate is in excellent condition with minor age marks. The back plate is in good condition with shallow pitting on the left shoulder, otherwise in nice condition. 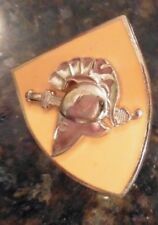 This is the Poly Resin Spartan Shield. -Queen Gorgo. -The shield features a handle and arm band. -The shield has been constructed with Poly Resin. At SwordNArmory, we are committed to provide you the highest quality products at the best prices. A Beautifully crafted, 16th-century 'Hungarian Style', Wing Shaped, Combat ready Hussar Shield for sale. Shield for sale only. The shield is combat ready. For a left-handed fighter (the shield goes on the right hand). 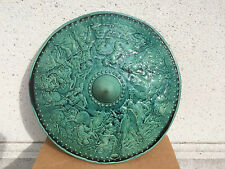 Surprenante Oeuvre, Casque Bourguignotte, Fonte de Bronze XIX e? Violet le Duc? C'est pour cela que je situe cette œuvre, dans cette époque là. Cette œuvre là est une réalisation non signée, réalisé à la cire perdu. En revanche les casses, puis le fond du casque laisse penser à une Fonte. Descriptif: Casque de gladiateur. A servi dans un parc à animation. Bon état, avec traces d'usage. Served in an animation park. Good condition, with traces of use. Perfect size for handling, handmade with spruce planks not plywood, Viking shield with thick rawhide edging and riveted/nails (like was used by the Vikings). weighs 3.5 kilos. The earliest forms of the armor found were worn by Celtic Chiefs in the 5th Century BC. Regular maintenance and care required to help prevent oxidation and rusting. High Tensile stee l is stronger and more flexible than regular mild steel. Odin's Ravens. Black Huggin and Munnin shield, screen printed by hand. perfect size for handling, handmade with spruce planks not plywood, Viking shield with thick rawhide edging and riveted/nails (like was used by the Vikings). The serpent grew so large that it was able to surround the earth and grasp its own tail. When it releases its tail, Ragnarök will begin. 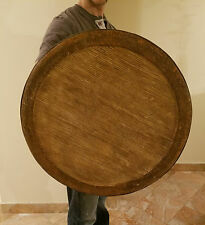 perfect size for handling, handmade with spruce planks not plywood, Viking shield with thick rawhide edging and riveted/nails (like was used by the Vikings). PARIS.1853". Misure totali: cm. OGGETTO VIETATO AI MINORI DI ANNI 18. Condizioni: BUONE. Misure del manico: cm. This is a Naoe Kanetsugu Armor Miniature Statue.Kanetsugu Naoe is a retainer of the Uesugi clan who served Kenshin and his successor, Kagekatsu. He is best known for convincing Kagekatsu to join forces with the Toyotomi, allegedly writing a scathing letter to Ieyasu before Sekigahara. OS-Plattform der EU-Kommission. Optische Gebrauchsspuren (leichte Kratzer) sind daher nicht auszuschließen ! Moving visor. At SwordNArmory, we are committed to provide you the highest quality products at the best prices. It is your responsibility to check the item for any possible defects before using this item. It features a brass cruciform front, as well as rectangular eye slots and a multitude of small circular cutouts to aid in ventilation, making it easier for the wearer to breathe and be heard. • Includes a genuine Leather liner and chinstrap. Perfect size for handling, handmade with spruce planks not plywood, Viking shield with thick rawhide edging and riveted/nails (like was used by the Vikings). weighs 3.5 kilos. Hand crafted and hand painted in England. Hauberk Size: Large. It was the armor of choice for many knights until the invention of plate armor in the 14th century. Each ring is riveted securely. It features short sleeves. Material: 18 Gauge Steel Flat Rings. This is the Royal Arms of England lion Shield. The back is painted black with a riveted handle mounted for vertical arm carry. - The handle of the shield is steel with a wood grip. - The shield has been constructed from 18 gauge steel. Regular maintenance and care required to help prevent oxidation and rusting. The earliest forms of the armor found were worn by Celtic Chiefs in the 5th Century BC. Sleeve Length (from arm pit). You are certifying that you are 18 or over. They are alternated with solid flat rings for a composite construction. Item is covered in oil to protect from oxidation. - Ring Type: Flat Ring Round Riveted Mild Steel. - Overall length: 46" (Fully extend as shown in picture). TWO HEADED EAGLE. WALL PLAQUE. COAT OF ARMS. CAST ALUMINUM. BUT IT'S BEEN TOUCHED UP WITH BLACK PAINT TO COVER UP. PRE-OWNED WITH MINOR NORMAL WEAR AND IMPERFECTIONS. A ONE OF A KIND. DON'T HESITATE. Review : I've owned quite a few pair of bracers, from the inexpensive imports from China to custom leather designs made by hand. These Leatherworks bracers from Palantoke are the. Rugged look, like they've been adventuring for years, and built to last for many more. The neck and shoulder area is one of the most important places that a warrior has to protect. Using these 20 gauge steel pauldrons with blade breakers will give you the ultimate protection along the top of the shoulders and neck area. It's easy for the officer to identify them on the battle field. The majority of the Roman Legions command fell to the Centurions. Brass bosses were added to the neck guard and cheek guards. Where the Coolus was constructed of bronze the Imperial was made of iron. Our artisans are experts in their skills. 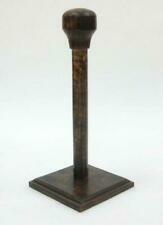 - Solid Golden Oak Wood Construction. Arm bracers are forms of armor that protect the forearm area. These 18 gauge steel arm bracers are well designed and thought out. Featuring folded reinforced rims and textured surface design, these bracers are simplistic in their elegance. It is just like ones made in mid-15th century Italy. Our black mini suit of armor is modeled after the one worn by Charles the Bold, the last Valois Duke of Burgundy. Handmade Sword. Greaves, iron shoes, iron gloves, elbow and knee bosses and shoulder guards protect the arms and legs. Knights Templar Royal Crusader Shield. The Poor Fellow-Soldiers of Christ and of the Temple of Solomon were created in the fallout of the first Crusade. This group were the first warrior monks of the western world and existed for nearly two centuries during the middle ages. Finely Constructed of 18G Steel. High Tensile steel is stronger and more flexible than regular mild steel. Length: 16.75 " Material: 16 Gauge High Tensile Steel. The earliest forms of the armor found were worn by Celtic Chiefs in the 5th Century BC. High Tensile steel is stronger and more flexible than regular mild steel. The aventail has butted high tensile round rings. They are made of 18 gauge mild steel. - Ring Type: Butted High Tensile Steel Rings. The back ground of the shield is painted in an aged white with the crimson cross emblazoned across the front. This is one of the most famous shields of the middle ages. This style shield was carried by the crusades lead by Richard the Lion Heart. This is the Functional Battle Ready Bascinet with Klapvisor. It's visor is attached with a hinge at the front center and is removable. Circumference: 26.77" Material: 16 Gauge Steel. Credit cards issued by a non-US bank are not accepted. The Muscle Cuirass was first used by the Greek Hoplite. These early Cuirasses were plate armor constructed from bronze. This plate armor is made of 20 gauge steel and is coated with copper. Not only does this look like an authentic piece, it is much stronger than its historic counterpart. This leather gear from Palnatoke have a rugged look, like they've been adventuring for years, and built to last for many more! Excellent quality, thick leather with heavy-duty stitching and soft suede lining.